The genus name Cymbopogon derives from the Greek kumbo, "cup," and pogon, "beard." Citratus, the species name, refers to its fresh lemony scent. Native to the tropics of Southeast Asia, lemongrass, a tender perennial, can grow up to 6 feet in height. It has long, narrow, pointed leaves that are rough and saw-like to the touch. The leaves grow in groups and sheath the stem at the plant's base, which is bulbous and fibrous. When the leaves are crushed they give off a distinct aroma of lemon. The flowers grow in a bunched panicle. Lemongrass thrives in a hot, sunny environment with sandy soil, but it will tolerate full sun to full shade. It requires moderate to high amounts of water and rich loam or sandy soil. Lemongrass essential oil has exhibited activity against E. coli and Staphylococcus aureus. The herb contains five components that help prevent blood platelet aggregation. It is used in the treatment of cholera, colds, colic, diarrhea, fever, flatulence, flu, headache, herpes, insomnia, parasites (especially nematodes), and stomachache. It is also considered a cancer preventive. Topically, lemongrass can be used as a compress to relieve arthritis pain and as a bath herb to soothe sore muscles. 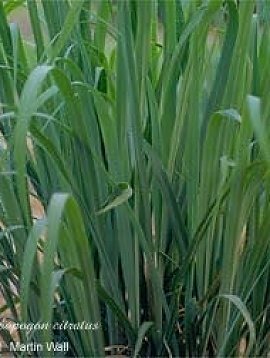 Lemongrass is commonly used in South Asian cuisine. It has a delightful lemonade-like flavor. Lemongrass is sometimes planted around homes to deter snakes. Avoid large doses during pregnancy, as it can stimulate the uterus.